Can you even believe that fall is upon us? In honor of the changing times, Here are a few things to get you into a fall-ish mood and maybe inspire a fun get togethers or just a cozy day! 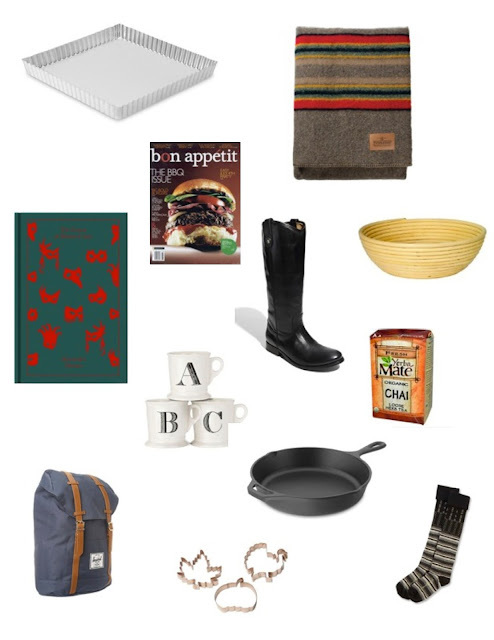 10 things for a preppy chef: Collected by my preppy chef sister. 1. William Sonoma square tart pan, for apple, pear, and cherry tarts. 2, A subscription to Bon Aptit magazine to read by the fire. 4. Bread proofing baskets, because what is more wonderful then fresh baked bread on a crisp day? 5. Melissa Button boots from Frye, these will last you years and make any outfit look amazing. 6. A new mug for all the tea and coffee you will be consuming this fall. 7. Yerba mate with chai spices to be consumed in a beautiful mug. 8. Herschel retreat backpack for the school year. 9. Copper cookie cutters for the seasons best cookies. 10. Knee high Smartwool socks. I am looking forward to the new season, you?